Don’t see your question listed below? Give us a call at 847-780-7323 or contact us. Why should I volunteer at Bernie’s Book Bank? If you’re searching for a meaningful and fun volunteer opportunity open to ages and abilities, look no further! 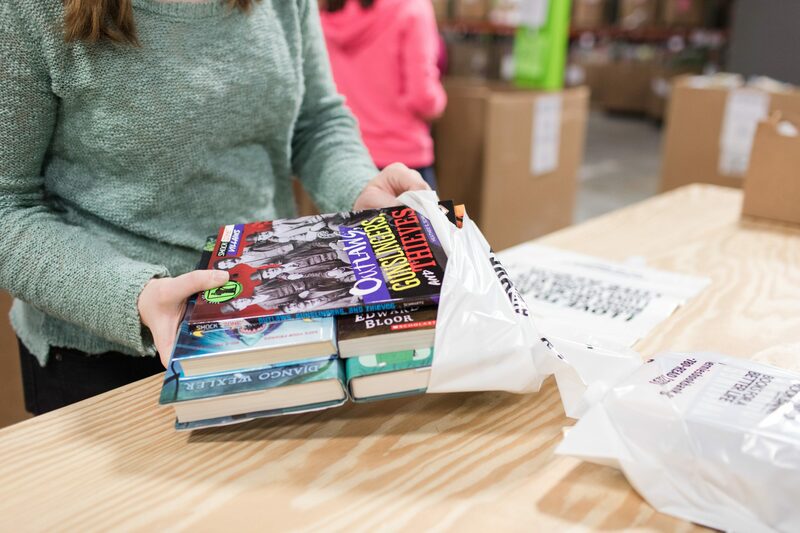 At Bernie’s Book Bank you will have the chance to make an impact in the Chicagoland area by preparing books for distribution to at-risk children. Come as an individual, with your family, friends, corporation, civic group or social group and you’re sure to leave knowing you’ve made a difference. What will I be doing during my volunteer session? We have a variety of jobs available during each session including stickering, sorting the books based on grade level and quality, and bagging the books. Will you teach me what to do? Yes! There is a job training at the beginning of every session. Do I need to make a reservation to volunteer? Yes! Please visit our online shift calendar to schedule a volunteer session. Yes! We love volunteers of all ages and abilities. Can I bring my child’s friends? Yes! Please register your group online and forward the confirmation link to the children’s parents. This will allow them to complete their child’s waiver ahead of time and give you permission to bring them in to volunteer. Please arrive 5-10 minutes prior to the start of your scheduled shift to allow time for check in. We have plenty of on-site parking available surrounding our building. While a book donation is not required to volunteer, we highly recommend that you bring donations with you! This is a way for you to double your impact when visiting Bernie’s Book Bank. You do not need to bring anything special, but book donations are encouraged! If you wear glasses, we encourage that you bring them in as well. Can I bring my purse, bag or water bottle with me to volunteer? We have lockers available on-site where you can store your purse and water bottle, but we do not allow bags, food or liquids in the Processing Center. Exceptions will be made for emergency medical equipment. Since we are a warehouse environment, please wear comfortable close-toed shoes. Yes! Please notify the Volunteer Services Specialist if you need special accommodations. I have volunteered before; do I need to watch the orientation again? An orientation will be given before every shift. You are invited to watch it every time to get the most recent updates, but you may wait in the Welcome Center until the orientation is over if you wish. You will be asked to join the group again when job training begins. Can I take pictures during volunteer sessions? Can I get credit for my service hours? Yes! We have service hour validation forms available at the front desk. Please request one at the beginning of your shift and pick it up when the shift is over. If you have a specific form from school or another organization, please bring it to the front desk at the beginning of the shift as well. Can I complete court mandated community service here? Bernie’s Book Bank works with individuals on a case by case basis toward the completion of their court mandated community service requirement. You may request to complete court mandated community service by filling out our application form. Please do not register through our online shift calendar until you have been approved by our Director of Volunteer Services. What if I cannot stay the whole time? We ask that you arrive at the beginning of the shift, so you don’t miss orientation and job training, but you may leave early if necessary. What if I want to make a weekly or monthly commitment to volunteer? We’d love to see you on a recurring basis! You can request a recurring shift with your desired frequency through your personal volunteer page. How do I cancel a volunteer session? If you need to cancel your volunteer session, please contact the Volunteer Services Specialist. Can we stay for lunch/dinner after volunteering? The time I want to volunteer is marked as full, is there anything I can do? In order to provide an organized, efficient and meaningful volunteer experience for each person we cannot accommodate more than the designated number of volunteers per shift. Please look for an alternate time on our shift calendar. If you need help finding a shift, please contact our Director of Volunteer Services. I would like to become more involved at Bernie’s Book Bank. What can I do to help? Individuals that would like to be more involved in our mission can join the 50 Hour Club. As a member of the 50 Hour Club, you agree to volunteer 50 hours over a 12-month period. You will receive an exclusive 50 Hour Club t-shirt! Bernie’s Book Bank offers 18 weekly volunteer sessions. Visit our online shift calendar to sign up for the volunteer session that best fits your schedule.